If you have a family, and money is at least a little bit tight, then you can appreciate how unaffordable family activities can be. A simple night at the movies for a family of four can easily be more than $50 or $60. Family vacations can be a serious budget buster, particularly if you need to fly to your destination. And concerts and theme parks – you probably can’t afford those with a family. But there are some strategies you can use that will make family activities easier to afford. This can quite literally be as simple as putting money into a cookie jar. Yes, it sounds cliché, but that’s mostly because it actually works. Anytime you have some extra money, just drop it into your cash kitty. You’d be surprised how much you can accumulate in a short amount of time just by dropping a few dollars in every few days. In fact, make it a point to drop loose change into the kitty too. It can get you a few extra dollars each month. By putting money into your cookie jar on a regular basis, you may very well have the money you need to afford an occasional night out or family outing. Since everyone in the family will benefit from the cash kitty, make sure that everyone also contributes. Naturally, that will include your spouse, but your older children can also contribute even if they have a very minimal job. Younger ones can contribute out of their allowance. If it’s for something fun, they’ll be more likely to do it. With everyone in the family dropping some money in the jar, you should be able to comfortably afford one or two family outings a month without having to disrupt your budget. In my family we make it a point to have two or three garage sales each year. We average about $150 on each sale, which means that we collect and extra $300-$450 each year. This can really help if you are planning a family vacation, or you just want to have a chunk of money sitting around to pay for the occasional outing. Like a garage sale, selling on Craigslist or eBay is something you can do on a regular basis. Keep a close eye on what you are accumulating in your basement, your garage, and even your closets. Also, take a look around your house – are there items that you have in plain sight that you either don’t use or don’t care about any longer? These are prime candidates for sale online. You can take it a step further by hitting garage sales in your area. You can get some pretty nice stuff for just a few dollars, and sometimes even for free, that you can sell online. This can provide you with a small, but steady source of extra income going forward. Whether it is going to the movies, restaurants, hotel stays, or various attractions for kids, there is usually some sort of membership rewards program. If you join, you can often get free or deeply discounted services that will enable you to do more than you normally would. By accumulating rewards points with Marriott Hotels we’ve gotten some free overnight stays. And some of the movie membership programs offer free concessions and occasionally discounted tickets. Join these wherever you can, they’ll really stretch your entertainment dollars farther. If you have any special skills – computer skills, administrative skills, teaching, music, car repair, landscaping, painting – you name it – put them to work every now and again through side jobs. Help someone learn a computer program, paint a couple of rooms for someone in the neighborhood, or clean-up somebody’s property in the spring or fall. This could lead to extra money that will give you more spending flexibility with the family. If you do this work on an ongoing basis, you’ll have a continuous source of funding for whatever your family wants to do. And this is an excellent way to gradually accumulate money for an annual family vacation. 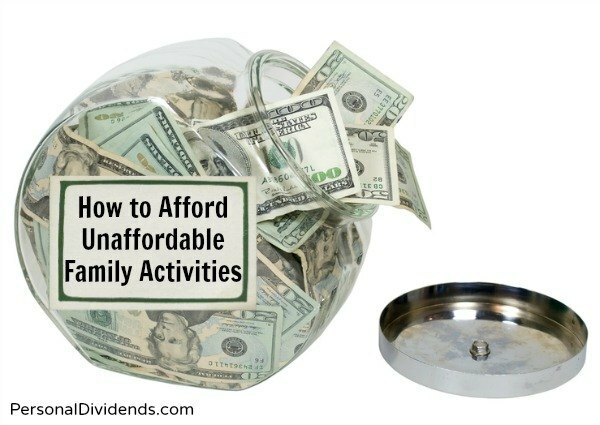 What do you do when you can’t afford an activity your family wants to participate in?